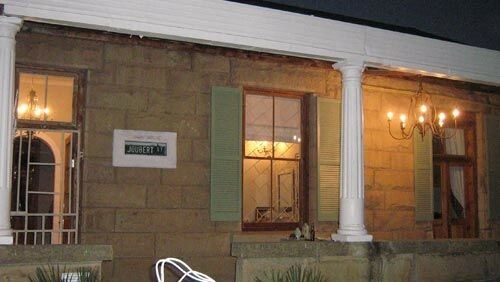 Situated in the small border town of Ladybrand, Villa on Joubert is a spacious sandstone family home built in 1925. 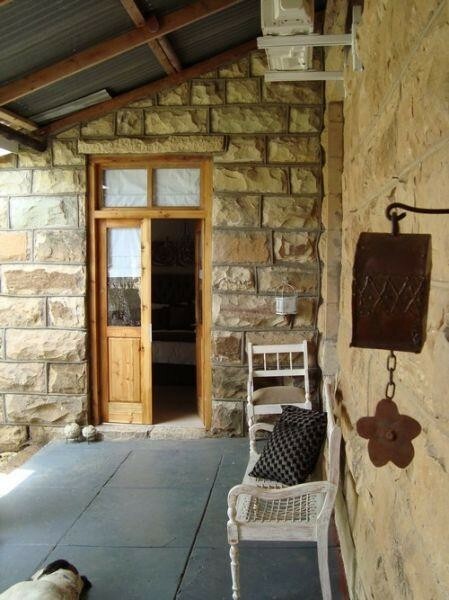 A cozy retreat for friends, family and guests on the main road of this sleepy little Eastern Free State town. Ladybrand is the gateway to Lesotho and is a mere 5 minute drive from the Maseru border post. It is surrounded by beautiful sandstone mountains and offers tourists all the modern facilities for a weekend break or an overnight stop on a business journey. Villa on Joubert offers visitors 5 luxurious rooms, each with its own individual atmosphere and design. Each room has an on-suite bathroom and choices of single, double or queen and kingsize beds are available. 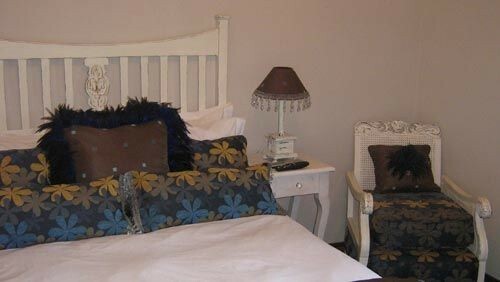 Every room is equipped with a remote controlled TV and DSTV. All rooms also have ample storage space for long term visitors as well as a laundry service. We also offer braai facilities, secure parking and every room has an external door opening up on to one of our spacious porches where guests can mingle, watch the sunset or simply enjoy a drink after a busy day. All rooms are also air conditioned for those cooler winter nights. 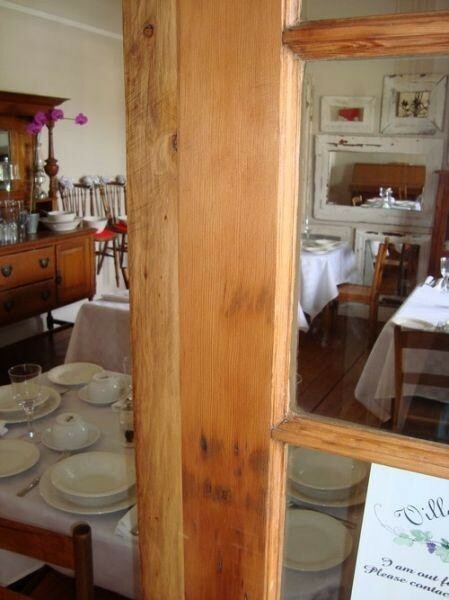 Our dining room offers visitors the best breakfast in town. It is a warm inviting space where freshly brewed coffee can be enjoyed while the sunlight seeps into the room from over the Maluti mountains to the east. It is the perfect spot to start your day as school kids and other locals pass by...the perfect introduction to small town life! Our Villa is decorated in the French destressed style and features handmade soft furnishings, furniture and original artworks. To fully experience the look and feel of our rooms - please take the time to browse each room on the navigation panel at the top of this page. This room is decorated in lush blues, ochres and chestnut browns set against crisp white cotton bedding. 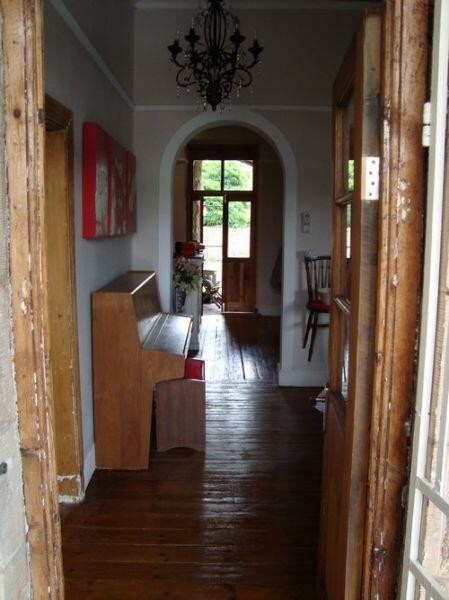 Dark wooden floors create a rich contrast with french washed furniture in off-white. An east facing french door opens onto a spacious porch where visitors can relax. It features an on-suite bathroom with shower. We have left no stone unturned when it came to attention to detail. Walls are adorned by original artworks, in this case a local artist, Corne Eksteen, has produced a work split over 3 panels based on a work by Van Gogh. Handmade soft furnishings spreads colour throughout the room. 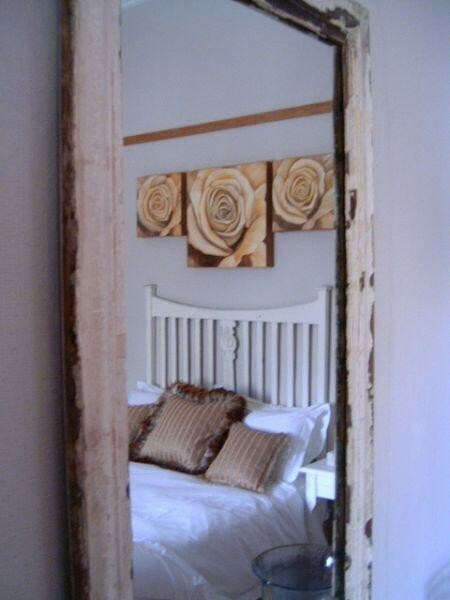 Among the many handcrafted items, this room's bathroom features a framed mirror which was framed using some of the building's original skirting boards that was removed recently when the house was renovated. This spacious room is decorated in shades of ochre, gold, cream and light terra cotta with rich textures ranging from velvet to silk. Every soft furnishing is trimmed with a selection of fine fringes, beads and feathers. Soft plush white cotton bedding adorns the queen size bed with handmade sandstone and glass bedlamps either side of the bed. A rose theme is carried through the room, from the 3 rose oil paintings above the headboard to handmade organza and silk roses used to create a focal point in glass vases. A comfy rocking chair guards the door and is the perfect spot for a night cap or catching the last bit of afternoon sun seeping through the french doors on a winters afternoon. This room has two entrances, one leading to the main house and the other to the garden area, giving the occupant quick access to the secure parking area. The disused fireplace with it's original mantel is offset by three striking modern artworks. Two shutters serve as entrance to the on-suite bathroom. The room has a vibrant yet relaxing atmosphere about it and the strong colours are softened by the curved lines of the furniture. External door - opens onto roofed porch with view of garden. This room fondly known as the silver room among friends, is one of our most spacious rooms and has become a firm favourite among guests. 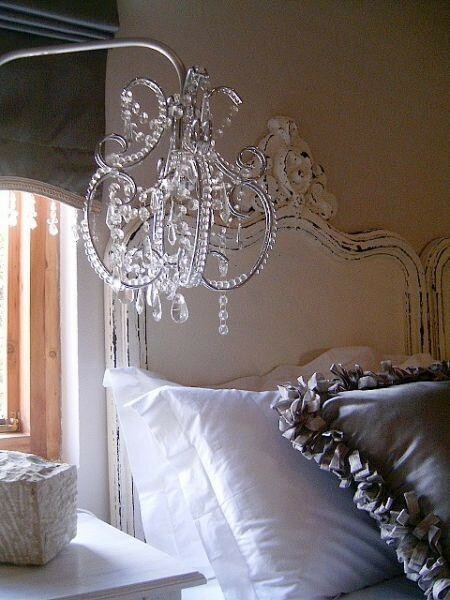 It might be our oversized king size bed that's responsible for that but we feel it is the opulant decor! 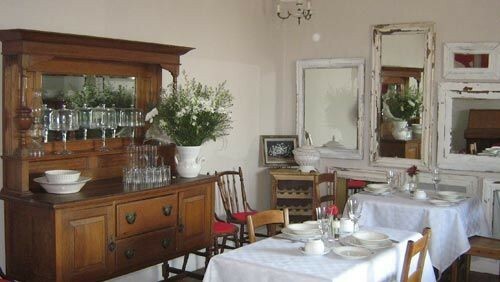 The room features a lush carpet, a beautiful old wooden cupboard and two handcrafted french headboards. The bed is finished off with two french bedside tables and two exquisite bed lamps, handmade from sandstone, metal and crystal. A cozy couch in the corner is the perfect place for some bedtime reading or just a few quiet moments while staring out onto the garden. Another interesting feature of the room is a sandstone wall that forms part of the room's interior. Ladybrand can be considered the sandstone capitol of South Africa and thus very apt that we feature it so strongly in our decor. This is our honeymoon suite. It is a spacious, warm and cozy room with a large french door opening up onto a roofed porch and a large bay window overlooking our garden. The bay window is the location for a small lounge area that is perfect for relaxing in the afternoon sun. The luxury on-suite bathroom has both a shower and bathtub and opens up into the bedroom with a large oregon pine door. The bedroom features a sandstone wall as part of the interior of the room that picks up on the warm shades of taupe that is used throughout the room's soft furnishings. The bed is made up in crisp white cotton bedding and rests against an upholstered headboard and complimented by 3 original oil paintings. 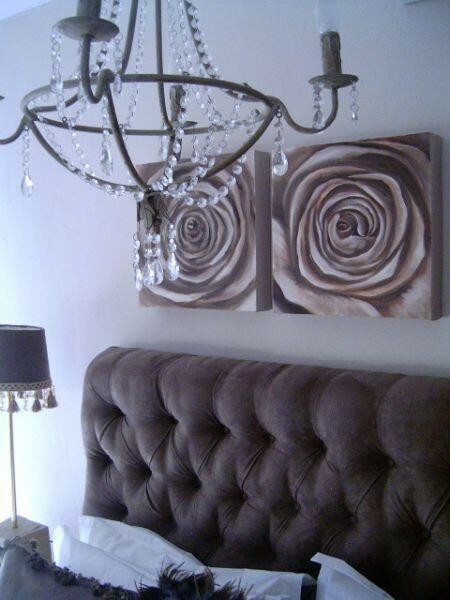 A rose theme is incorporated into the bedroom's decor.